Submissions must come in within 12 hours of the Game Jam ending. Submissions can be based on any number of themes, but must incorporate at least one of the randomly generated themes. No Pressure. Just have fun with it. Submissions will still be accepted even if they’re not complete. If you win, you will be responsible for hosting the next one, typically the first weekend of the next month (July 4-6). If you know that you will be unable to host the next TAG, then please indicate it in your submission. 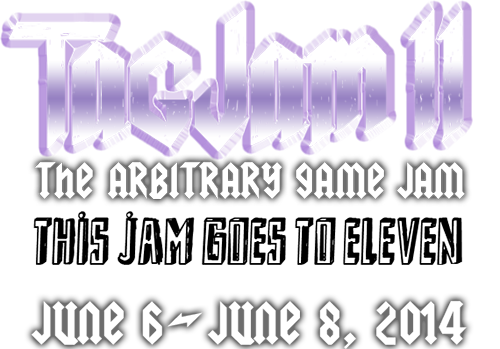 Entries will be judged by bunnyhero and Jupiter Hadley (winners of #TAGjam10, host of #TAGjam11). If there are more games submitted than usual, then the judging results may take longer. You may submit more than one game if you want to or need to. These bonus rules are additional challenges for your game development. They’re optional, but including them will help your game rank higher in the final judging. Add something to your game that “goes to 11,” as inspired by this clip from This is Spinal Tap. Feel free to interpret this as broadly or as creatively as you like. Maybe a knob or gauge or level that goes beyond the expected maximum, or perhaps a character is really bad at math concepts. For more inspiration, there’s actually a Wikipedia page on the subject. Have an 11-year-old (or younger) child create some or all of the graphics or sounds for your game! Make sure you get parental permission. Also, if it makes things easier, we can allow some leeway on the age (so 12 or 13 is OK too).